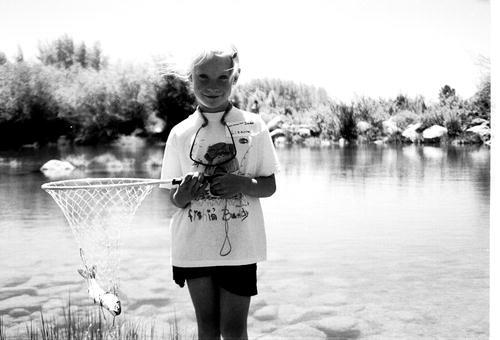 Pinedale First Grader Lisanne Fear and her catch at Kids' Fishing Day last Saturday. Last Saturday, approximately 70 kids and their families participated in the kids fishing day at the CCC ponds above Fremont Lake. This was the eleventh annual Kids' Fishing Day, and the first time the event has taken place at the CCC. In years past, the Kids Fishing day has taken place at the Pinedale Town Park. Before the kids started fishing, there was a small dedication for the CCC Ponds. Jack Doyle started off the ceremonies, announcing that every goal that was set for the CCC ponds had been accomplished. These goals included rest room facilities, and public access, along with many others. Several dignitaries spoke following Mr. Doyle including Mayor Rose Skinner and the president of Trout Unlimited. To conclude the ceremony, Elaine Ullery presented several students awards for all of the work that they had put into the ponds. These students included Grant Golden, Sara McClean, Tony Fiornscente, John Cavanaugh, Liz Storrud, Morgan Johnston, and Matt Barkley. Registration for Kids' Fishing Day began at 10 a.m., and by 11 a.m., cars reached all the way out to the road. Signs stating different names of fish - everything from catfish to mackinaw to walleye - stretched out around the parking lot area. A small table was swamped with kids and parents signing up for the event, receiving name tags, and given group assignments. Each of the groups had a guide who would take them through five stations and then let them go fish. The five stations included macro invertebrates, fly casting, spin casting, knot tying, and fish identification. At the fish identification station, the instructor had children try to figure out the names of different fish. After the kids were done, the instructor would reveal the real names and gave a few details about each species. The knot tying station mostly explained how to put worms on the hook. Elaine Ullery taught the macro invertebrates station. She and her assistant, Holly, explained how one could tell how polluted a body of water is by what insects live within it. The other stations, spin casting and fly casting, explained just that- how to cast a fishing pole. In addition to a day of fishing, a lunch featuring pop, roasted pig, hamburgers, hot dogs, potato salad, pork & beans, corn, and chips, was sponsored by Trout Unlimited. Each group of fishermen stopped to eat. When the kids were ready to leave, they were awarded a certificate and some prizes, including clips and handkerchiefs. Most of the kids had a good day of fishing and caught three or more fish, but some didn't have such good luck. When asked if they had caught any fish, one of the guides responded, "No, we're just having fun catching sticks!" Most of the kids seemed to look delighted with the sticks they had caught. A few of the groups were defensive about their fishing spot, shooing away any other fishermen who dare approach. Everyone seemed to be having fun, which was the main goal. "The more kids we get fishing, the better," said volunteer Mike Davis after the day was over. Many people echo his thoughts as they drove home, exhausted from a good days fishing.